His striking and beguiling paintings feature rich, bold colours and the symbolism and surrealism of the magic realism school of Latin American artists. But 44-year-old Monthian Yangthon hails from closer to home. Born in Songkla, the cheery and personable painter – “just call me Mon, my friend” – studied Fine Art at Pattini University and been engaged in the discipline ever since. For the last seven years, Phuket Town has been home for the southerner. 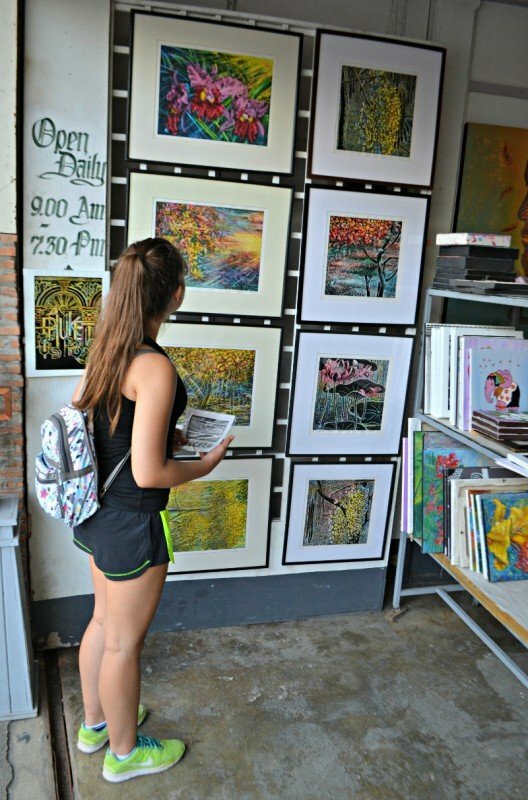 And his studio-gallery-shop is located close to the town’s historic core, on the Phang Nga Road and a few metres from the venerable On On Hotel. A devout Buddhist, Mon likes to create Buddhism-themed artworks. And even those works that don’t primarily feature his faith and the Siddhartha Buddha, often subtly incorporate Buddhist motifs. Monthian divides his productive days almost equally between working on his acrylic-on-canvas paintings and smaller black-and-white woodblock print of icons of pop culture and 20th Century history. The latter include excellent likenesses of Salvador Dali (whose oeuvre is evidently an influence on Monthian’s own imagery), Mahatma Gandhi, Pablo Picasso, Bob Marley, John Lennon, and many other instantly recognisable visages. Asked about the dreamy quality of his larger works, Monthian explained: “I was born and raised in a farming community in the south, and I often refer to the still-vivid dreams I had as a child while living in this tranquil environment, when I am painting. Mindful that Monthian had customers to attend to, I asked for his card as I prepare to leave and let this gracious man to take care of business. “No card,” he said. Then added, “but you can have this,” as he signed one of his wordblock prints, and presented it to me. “How did you know I wanted that very Pablo Picasso print?” I asked. In the historic and creative heart of Phuket Town, there are no ordinary moments.